What a terrible indictment of the British press we see this morning. The Mail runs a spurious story about Nick Clegg making a supposed Nazi slur against Britain. The Express reckons he wants us to be overrun by immigrants. The Telegraph accuses him, of well, properly declaring donations made to him to employ a member of staff. I haven't seen The Sun yet, but judging by their tirades against him over the last few days, he will probably be accused of fathering Kerry Katona's latest child and then paying her to get rid of it. Personal attacks on Nick Clegg will not work. They will backfire on those who make them and rightly so. Everyone who knows Nick Clegg likes him. He's a transparently likeable individual. Anyone trying to make out that he's anything else will come a cropper. Of course politicians should be scrutinised and questioned. But not like this. It's these kind of stories which my mother will tell me prove her right in her delight that I was never selected as a candidate. She thought I was mad to want to get into parliament because she thought I would be subjected to personal attacks like this, or worse. And who's to say she wouldn't have been right. And there you have it. An explanation of why so many good people don't even bother to apply to be candidates any longer. Why would they put themselves through what Nick Clegg is going through? I predict that these vicious attacks on Clegg will only serve to increase his popularity and position in the polls. If that happens it will be a sure sign that the power of the press to influence an election is on the wane. And that would be about the only good thing to come out of this sorry state of affairs. Because in those circumstances, we would definitely be in hung parliament territory. And that would not be good. Not good at all. This kind of principled standpoint is exactly why I read your blog, Iain. Well done on taking the honourable position, and trying to keep politics a battle of policy, rather than class or personality. Iain, I think you make a fair point. The depths that out press will stoop to is disgusting. I think you're right Iain. But it could be all forgotten if Brown or Cameron, or both, perform well on Sky later. I think you are to be congratulated for taking a position that is well reasoned, intelligent, and moral. I applaud you Iain. If you're not going to help us demolish this charlatan, then just get out of the way. Sorry can't agree Iain. This is what our press call scrutiny and in the past it has focused on the two main parties. Now they are doing the same to the 3rd party after their leader said they were purer than snow. This was the red rag to the bull and as far as the press and I am concerned, when you put yourself up on a holier than thou pedestal then you deserve to knocked off if you aren't. It's the reality that Lab and Tory have been living under for years. If you want to play with the big boys you have to take the knocks like the big boys. Look at "poor" St Vincent at lunchtime, exposed as third rate under simple questions that people didn't bother to ask before. What I really hope is that these press smears aren't being coordinated by political parties. That they all come out on the same day - hmmm is it just because there's another debate tonight, or something more sinister. After all, the people in the shadows haven't gone away. Despite not being a Tory voter, and disagreeing with you on many subjects (though keeping my comments to myself until today), I read your blog precisely because I find you fair most of the time. You've proven your integrity with this post. You could've easily joined in the smear campaign, but you didn't. Let's also not ignore the fact that you're correct; smearing Clegg won't work. There's a choice. Either one can attack, and expose weakness, or one can not attack, and risk that weakness is not exposed. The moral position is - expose weakness, but don't personally attack. The reality is - unless your position is biting and newsworthy, it does not get reported. Difficult tightrope to walk, and the news agenda relentlessly moves forward. There are no prizes in adopting a moral position 2 days after the event became fish and chip wrapper (or, in a digital age, moved down the blogroll to page 3, where no one ever clicks). Given the importance of this election to Britain's national future, on balance I'd say that Tory bruising of Nick Cameron now, on the day, is more beneficial to our national good than a considered and fair minded response in 2 days time. And, from a Labour and Lib Dem perspective, they'll play the same game.
" ... most people can see with their own eyes that he is a transparently decent individual." I find it hard to believe that you, with all of your political experience can be so naive. Did not a huge number of people (if not most) think exactly the same thing about a certain Tony Blair after hearing non-stop sleaze allegations about his opponents for months on end? Nick Clegg has been economical with the actualite concerning his life so far, and if there had been nothing there to find, if he was so transparently decent, why, there would be absolutely nothing for the wicked press to write about. The same applies with his party policies. Was he comfortable seeing the Lib-Dem posters lying about Tory VAT plans knowing his party will impose VAT on new housing? A bit of fair commentary as opposed to the MSM - how refreshing. I'm not sure who I'll be voting for yet, but these attacks really do make me want to vote LibDem, rightly or wrongly. This kind of propaganda from the right wing press genuinely scares me. Fitaloon, Cameron has never been subject to such blatant attacks. This is NOT fair. how can you not see that? And Iain, thank you for being honest. I did consider voting for the Conservatives but the lack of economic policy meant I chose not to. I also think this Big Soceity idea is a bad one since it hasnt been very well thought out. I shall be voting Lib Dem not cos of the TV debates but because I don't trust Labour and I reckon vince Cable would make a FAR better Chancellor than Gideon Osborne (yes that is his real name), and because I like a lot of their policy (especially on fairer taxation for instance). And these media attacks are backfiring. I know my parents (who always used to buy the Daily Mail) have now stopped buying it for example and I am sure they're not the only ones. I genuinely think it is putting the Conservatives in a bad light cos everyone knows the papers attacking the Lib Dems support them and the attacks just look plain desperate. Due to the fact the rightwing media are constantly scoring own goals, I don't mind if they continue to be honest but it is rather sickening to see how low quality a lot of our media is. We have only had one tv debate, it is remarkable that the papers have started to do this. A con/lib coalition is far more plausible than the media portray, on principle it feels wrong when the media decides it can choose who governs Britain. I think it would be an interesting move if Cameron was now to criticise the more ridiculous stories- it would make him come across as honest and principled. Great post Iain - and shows you have far more integrity than the editors who've put this stuff on their front pages. I hope the broadcasters tomorrow do a sense check before repeating any of it. The papers aren't as important as broadcasters often seem to imagine. Very even-handed Iain, and yes, fair - up to a point. Given that all three main parties are enthusiastic supporters of Turkey's prospective membership of the EU, and our continuing subservience to 'EU law', it would be difficult to argue that any of them don't want us to be overrun by immigrants. I also think that, being a Lib Dem politician, Mr Clegg must have developed a pretty thick skin over the years and is probably less concerned by the nature of these attacks (other than any possible negative electoral effect, which I agree is likely to be non-existent) than you are. Talking to my other half earlier (non-political but puts up with my constant talking about the subject), she said she heard Nick Clegg on a national radio phone-in earlier, and that he had come across 'terribly', that he had no idea how to talk to people and was completely disrespectful of a couple of callers. Hopefully lots of people in her (LibDem) constituency heard the same interview - it's much better to let politicians be the architects of their own downfall. Of course, the TV debates don't give us any insight into that side of the politicians' character, because the audience have to sit there like stuffed turkeys. Indeed after the first one I'm no longer regretting that I had to decline an invitation to the third. I actually think the same can be said of most politicians. Good for you, Mr Dale...and thank you for your fairness. I'm painfully aware that I have questioned your integrity on here in the past and trust I won't ever do that again, because whilst I might not agree with lots that you right - you clearly do have integrity and by the bucketload. I agree with fitaloon. Dirty politics are unattractive and may be a reflection of the dearth of big ideas in this campaign, but a national leader has to be able to deal with the slings and arrows. It's an election man. Everyone is playing the game - are you losing your bottle Mr Dale? No wonder your not standing this time around!! One bad day of press for Clegg is nothing. How many bad days have Dave and McBroon had? It s about time that the Lib Dems have a bit of hostile attention. Very easy ride so far. How else would the people judge how Clegg and his merry band of vegetarians will behave when the proverbial really hits the fan? Regarding the Daily Mail story about winning WW2, it must not be forgotten that China also won that war. Anyway I look forward to Mr. Cameron telling us more about the threat from China and why Britain must spend billions on Trident to counter the yellow peril. Hilariously The Sun may be the most reasonable. It is not a point of substance but it does show the party can be incompetent, by leaving debate notes in a taxi. Absolutely agreed, Iain. I think there's going to be a general sense of 'if this is the worst they can say about Clegg, he's not really that bad, is he?' - plus the kicking from the media does rather enhance his anti-establishment, fresh outsider credentials. So, yes, not exactly a smart strategy. Your polite, principled disagreement is better in every way. Loved the post Iain and totally agree. Then saw your book cover on Labour Sleaze picturing Gordon Brown with his trousers down. Read the mail article, his anti British sentiments are quite shocking. He wants to put us "back in our place". Do we really need another PM who hates the British people? This is the M.O of the Telegraph. Much of what was printed last year unraveled very quickly as having been 'well within the rules', so they rewrote the rules to fit their own moral agenda: kicking politicians to sell newsprint. I can't see what Clegg has done wrong here, but his holier than thou attutude (which has been completey misplaced) has left the rest of the political spectrum seething, and the papers looking for any dirt they can find. They only need to look at his past expenses. He has plenty to worry about right there - he didn't go light on spending our money. In fact he spent more than Brown. Attack his policies, they are bad enough to make you laugh, there's no need for this kind of smear. I hope that you are right that this garbage “journalism” won’t work. But grossly unfair and over-personalised abuse of politicians is sadly not new and it has had some effect in the past – ask Neil Kinnock! There is not a lot that can be done about it if we want to protect the freedom of the press – post-hoc complaints to the PCC are always too little and too late, as you know Iain! Murdoch has not tried to make Sky News a clone of Fox – so far anyway and we can expect Adam Boulton to be scrupulously fair tonight in the debate. But his other arms The Sun and The News of the World are different – can The Times be far behind? Paul Dacre’s Mail, the home of Richard Littlejohn, has no scruples, principles or values – but it does have readers quite a lot of them! The Express is little more than a sub-standard clone of The Mail and is owned by a man who won’t ever be worried about pandering to the lowest common denominator – that’s how he made his loot. I hope that your civilised blog on the subject of the attacks on Clegg has been read by some of the team at the top at Central Office. A discrete phone call to the editors of these grubby papers might have some effect – on the other hand a headline “Cameron tells press to lay off Clegg” is just as likely ! What can you do? I think it's worth separating out these attacks. Lumping them all together is slightly misleading. The weakest of the bunch is the Telegraph story. This strikes me as badly researched, and unlikely to do any damage. There's a very slight chance that it might spark some lingering resentment from the expenses saga, but I wouldn't count on it. The Sun and Express stories (largely about the LibDem immigration policy) have a little meat on the bones, but I don't think they're going to have a huge impact. Having an "open doors" immigration policy is actually a valid political choice. You might disagree with it (I do) but it is a legitimate place to be on the political spectrum. The LibDems aren't actually too far from Boris on this issue. The really dangerous one for Clegg is the mail story, about his Guardian article. I don't think it's fair to portray this as a "personal attack" on Clegg; it's just quoting his own views back at him and this time, I think the views lie outside of what of what would generally be considered the respectable part of the political spectrum. These views are more aligned with the nasty, extremist left (Socialist Workers etc) than with mainstream voters. If this were the US, Clegg would currently be preparing his resignation speech. We're a little more forgiving, but if he seeks to be Prime Minister, he still needs to explain whether his article (which is less than a decade old) still reflects his current views, and if not, what has happened to change them. Going after Clegg will probably be irresistible for Brown and it will do him no good whatsoever to try to smear somebody that the public seems to like. I hope he goes for it! Cameron probably has a bit more sense and knows he might have to work with Clegg after the election to get a form of government into place. I suspect that Cameron is saving all the good stuff for Brown in round 3 and will go for the knockout blow. Brown will just do more of the same, grabbing big round numbers out of the air to support his assertions with no basis whatever for them. Like 100 buses in Madrid, like 1,000,000 new jobs when unemployment is at its highest for years and rising, like another million children taken out of 'poverty', like billions being spent on public services which continue to get worse, etc., etc. Nobody will listen, nobody cares, nobody believes his assertions anyway. He's dead meat. he's lost it. His only support are those on long term benefit and those with 'Vote Labour' stamped on their birth certificates. Totally disagree with you Iain. Clegg has come over holier than though and the one thing people can't stand is hypocrisy. Clegg is a hypocrite. You don't even mention the identity of the donors who are all city lobbyists who benefit from Britain's continuing subjugation to the EU. If he plays the whiter than white card he deserves all he gets. I also don't agree that he is decent. He comes over to me like a petualnt school boy prig. Clegg may be a nice guy in person but he is also a shameless liar trying to win votes from a ill-informed public by wilfully misrepresenting other's policies (ie VAT bombshell) to a much greater degree than the other two parties do. He only gets away with this because he hasn't previously been under the same scrutiny given to Brown and Cameron by the MSM. Having just read the Mail story, I think it is a fair subject to attack him on. Germany has much to admire and underneath, our pride in WWII is less about beating Germany, than in our ability as a country to stand up and be counted in the face of someone/thing who would attack our democracy. The story shows Clegg's lack of understanding of British national pride and hence our unwillingness to be ruled by the EuSSR. He would willingly surrender all of our political control to Europe and as such I think this article as a valid commentary. "If you want to play with the big boys you have to take the knocks like the big boys." This isn't about policy or scrutiny. It's about penises. To put it crudely, the right wing press are insecure, they need to lash out and show how big theirs are. As if the any newspaper ever ran three days' worth of front-page spreads on Cameron or Brown doing things correctly. Anyone defending this on those grounds is delusional. The Mail is a cancer on the British body politic. I could have let you know what was coming yesterday morning. It is known as The Coulson effect. You must be so proud of your party. Well , Iain - Very great kudos to you for this post , you clearly support the wrong party . I hope that Clegg takes head on the press on this and challenges the editors of the Sun , Mail and Telegraph to an immediate public debate . They will run for cover as the cwards they are . You sound more petulant and outraged on his behalf because you are a prospective politician yourself, which proves the point I've made many times, that you just don't get it. Listen to the ordinary man in the street. Don't give us any guff about how you do BTW, because you don't even if you think you do. This may be principled, but I don't think so because of the above, but it is naive in the extreme. This is why the Tories are languishing, and will continue to do so. Have you learnt nothing from Blair, Brown and Mandelson since 1996? All very honourable and noble Iain but its a pity you seem to be saving your outrage for anyone daring to point out Clegg's foibles while ignoring the fact that Brown and Cameron have been subject to character assassination and smear by the press and their opponents for years - all of which has allowed Clegg to pose as a political saint. The fact that he is in fact a established member of the political class who made a fortune off the taxpayers back as a Euro MP makes a nonsense of his 'Im not one of those insider politicians' pose - so why shouldn't the public be allowed to see something of the political baggage he has accumulated, just as they've been exposed to all of Brown's and Cameron's dirty linen? Is The Blessed Nick somehow allowed a free pass? What is happening to Clegg is a kind of equalisation, all compressed into a few days - but it IS equalisation and I didn't see the Lib Dems baulking at any of the endless personal slurs on the other two party leaders we've ALL absorbed insidiously over the years as an electorate. Clegg is not 'different' - he's a politician like any other who is finally being subjected to the same nasty rules as the others - and given we're electing a government it seems, on image/personality alone now - that seems fair enough to me. I think your mother may have been right Iain. Fate has done you a favour. You are much more effective away from the backwoods of the backbenches with no power or influence and snigggered at by civil servants. Like you I'm apalled this morning. None of it amounts to a hill of beans. Clegg hasn't even claimed to be purer than snow, whiter than white or even a political outsider. The trouble is, it looks like we're orchestrating all this vile rubbish in Nasty Party style. I wish DC would just come out and condemn it all this morning to separate us from it before we get the backlash. "[T]he British cross is more insidious still. A misplaced sense of superiority, sustained by delusions of grandeur... We need to be put back in our place." Personally, I would prefer the politician who is proud of our past and feels the country is deserving of our appreciation, rather than one who clearly thinks that we're second-rate. The Mail in particular has been absolutely disgraceful since the last debate, smears on Clegg's background, on his family, even using the names of his kids as a pejorative. Its very very sad to me that we have had to fight wars to keep our free speech and this is the way some element of the press choose to use it. It is right that Clegg and the Lib Dems should be examined, questioned etc- but no party leader has faced the kind of violent onslaught Clegg has faced over the past few weeks. I hope your right and it backfires and exposes the Mail and the Sun for what they really are- two papers that like to pretend they control the will of the public rather than simply the biggest bandwagon jumpers since the Wild West. so just why is a transparently decent individual paying donations into his personal account Iain? are you trying to tell me the lib dems don't have accounts for receiving monies? do all donations sit in paper bags under chairs at hq? clegg was declaring donations, he sure as hell wasn't declaring they were going into the account he pays his household bills from. what above board reason is there for doing this? none whatsoever. 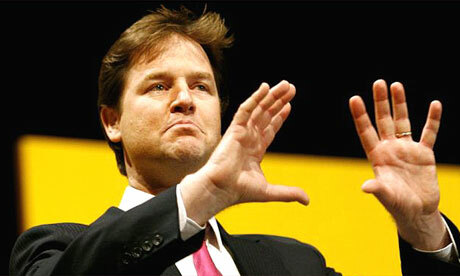 i note mr clegg has not leapt before the cameras to offer his explanation.........if it is so innocent where is he? For years both Brown and Cameron have been under microscopic scrutiny, yet on the basis of some freakish hysteria we have a nice new shiny saviour whose history and character, as yet, has not been revealed. The comment on the Times comment section on Saturday that "I'm voting for Clegg, at least he'll stop all the immigrants" reveals the fact that the surge is appallingly ill-informed and purely dazzled by a media frenzy. So Fleet Street are lining up to reveal the real Mr Clegg? Good. So it's dragging politics into the gutter? Where the f*** do you think it's been for the last 20 years? Casually debated in the salons of the urban elite? It may shore up and consolidate 9 out of 10 Cleggys but do not disregard the 10% who'll drift. If you had been selected to stand in a marginal what would you have given for a 10% drift from the Lib Dems back to you at this stage of the game? Sorry Iain but that's politics. Negative campaigning DOES work, the BBC attack the Tories all the time and it's had an effect on the Tory lead. I don't see these as unprincipled attacks. They are retorts to lines of attack used by the Lib Dems or elements of character used by them to show they are holier than anyone else. Clegg made that slur about the other parties expenses ( he used the old Blair trick of setting up the question himself very specifically, but in a way he knew the public would interpret as general then hitting full sanctimonious self righteousness mode ). He nelgelcted to explain about the moves against his own MPs or his own problems here. So the expenses stuff is fair comment. Clegg makes a big thing of burning Britain's Atlantic bridges and pushing us towards being consumed by a foreign state ( which he used to work for ). So his comments on Britain's place in the world are fair comment. The Lib Dem policy of a immigration amnesty, which its proven just encourages vastly more illegal immigrations ( as his Spanish wife could tell him ) is fair comment. He's not been subjected to the sort of class based attacks from the left media or Labour party that David Cameron has, despite having just as posh and privileged an upbringing ( which we only learn about now in the MSM ). Iain I think your showing Stockholm syndrome here. The Lib Dems are the most dishonest and in many way disastrous party in British Politics and its about time they received some real scrutiny. ( Just look at the casual misleading statements in each cooked up Lib Dem bar chart up and down the country ). Don't be so soft Iain. I still think he's horrible, very much like Tony Blair. "if there had been nothing there to find, if he was so transparently decent, why, there would be absolutely nothing for the wicked press to write about." well said. You've just gone a long way up in my estimation. Well said Iain. To quote Ghandi: “First they ignore you, then they laugh at you, then they fight you, then you win." You make a fair point but I do wonder if you would have made it in defence of Gordon Brown. Iain, I stand in agreement with most other posters. A fair analysis of shameful 'reportage'. Your desire to be Mr Reasonable really does go too far sometimes. Why is the Mail’s attack on Clegg “spurious”? What he wrote in his Guardian article that they are quoting was that Britain has more to feel guilty about than Nazi Germany. I think that is a pretty insulting thing to write about your own country and the Mail is right to draw it to our attention. Okay, so he wrote it way back, and before he became leader, but it was still his view then and he should be asked whether he feels the same way now. As to the Telegraph and the expenses, maybe it was all within the rules stuff, but the public hasn’t accepted that as a defence for anybody else, so why should Clegg be any different? Many (not all) of the expenses stories have been unfair to a greater or lesser extent to the individuals concerned, but that hasn’t stopped the Liberals topping the league table in sanctimony, so you’ll have to forgive those of use less sainted than yourself for enjoying some payback time. Let’s not forget that Clegg’s basic pitch to the public is “trust me, I’m not a politician”. Except that he is. A guy who bases his message on such a fundamental deceit has it coming. Many thing about the Lib Dems require deeper scrutiny - their incoherent economic policies in particular - but the Mail and the Telegraph front page are beneath contempt. A quarter of a century in marketing and sales has taught me that rubbishing your opponent does not go down well with customers (in this case voters). Personal attacks make the insider clique feel oh-so-clever but seldom win votes. Up to a point, Lord Copper. The Liberals are the dirtiest fighters at street level and if you had heard Chris Huhne shouting down Humphrys this morning on the Today programme for daring to suggest that Clegg was just as much a political insider as the other two, which he is, except worse as he slithered up the Brussels gravy drain, you would have heard their nasty side in the raw. Of course their other side is shambolic bearded teachers and the like. Twas a joy incidentally to look at the clip of Cable being taken to pieces by Neil and Flanders. It made one want to make babies with her. Lets not forget that the Lib Dems are the party that advised "be wicked, act shamelessly, stir endlessly". There great genius has been that only other activist know what they are really like. I respect every human being. I worked with Libdems and Labour in my borough as a school governor and attended Libdems meetings as an invitee as they mistook me as their supporter. I can tell you, they are real nasty when it comes to cooking up things for personal attacks. The media is rightly scrutinising Clegg in his work as a lobbyist for RBS and what he did in EU and his expenses, just as Andrew Neil rightly tested Cable. Clegg has long been left out by the media and hence he got away saying "plagues on both your houses". Had he been scrutinised by the media before the first debate, he wouldn't be presenting himself as someone purer than white. We know at the local level what Libdems can be capable of-saying onething to one group and opposite to another, dishing out dirt, wink wink etc.. There are a number of Libdems bloggers propping up here these days as rebuttal automatons. While I detest any persoan attacks on Clegg or his family, if he presents himself as the net PM of this country, he and his aprty I am afraid should be scrutinised much harder than the media is doing now. I am not Euro sceptic, but this person will drag us deep into Euro and lumber us with PR so that he and his buddies can have power and perks. I lived in Scotland during Libdem-Lab coalition and know its fall out and particualrly how Libdems can be selfish b*****s.
So who do you think initiated the attacks? And what should be done with them? Oh come on Ian - its no more than the LibDems have always behaved.Listen to the words coming out of Cables mouth. What should we do . Let the press pull Cameron and Brown to pieces as they do (including you) but be nice to the 'nice honest Mr Clegg' - If the guy wants the top job he should show us how he deals with it. And....if a few low blows can prevent the chaos of a hung parliament, can prevent the continuation of a badly mismanaged economy, can allow me to run my business more efficiently, can protect the country and its people, and can uphold whatever's left of British self-rule, then so be it. For God's sake this is not some public school debating society where the gallant loser buys the cupcakes. These are desperate times and millions of lives depend on a positive outcome. Aim low and kick hard. Your the Nick Clegg of the blogesphere how long before your bubble is burst ? good post though while clegg and the rest need to challenged on issues personal attacks will only serve to give him more sympathy. He has questions to answer tonight as do DC and Brown. Iain, you are absolutely right. Given the gaping holes in the Lib Dems' policies, there is plenty of scope for scrutinising them fairly but it seems that the old politics of the smear rule the day. You do realise that all of this is being done with the tacit consent of Tory Central Office, don't you? One click of his fingers and Cameron could make this stop. But he chooses not to because he is desperate for the political advantage that it may confer on him. In that respect he has proven that there is nothing remarkable or new about him, if we didn't know that already. I wish I could share your belief that this will all backfire. It may do (and this is a very different election) but historically these attacks tend to work. Ask John Kerry. And good luck to Cameron if this propels him to office but I fear the price paid in the process is a guarantee of the same old politics. Dave will be beholden to News International and appeasing the Mail, Jan Moir et al. Not attacked enough. To my horror, I found out that he is a luvie. There is nothing wrong with actors, but the last politician who loved acting was also the biggest liar we have ever had as PM. Now what was his name? Bli..ar possibly? Sorry Iain, I have to disagree. Clegg gained popularity last week by telling the country that he and the Lib Dems were different and whiter than white. Those who follow politics know that this is not the truth and the voters need to know that Clegg and his party are not different. Clegg is getting an easy ride because until recently he has largely been ignored. I honestly believe that the Lib Dems doing well would be a disaster for this country (with their idiotic policies). I would rather see Labour win outright than have Nick Clegg anywhere near power. I do think that personal attacks are out of order, but he should take political ones like any other party leader. The man is an hypocrite, he has slagged the other parties off over expenses when he has had his head in the trough with them. Loves the EU and wants to join the Euro. He should not be attacked personally, but his words and policies do deserve scrutiny before it is too late. Don't forget that Brown and Cameron have always had to put up with attacks from the media. Finally, I AGREE with Iain Dale! You are right to suggest this smear campaign against Nick Clegg will backfire. The public will reject all these conservative newspapers who treat its readers as fools. The public will also reject the politicians who perpetuate this nasty and very ugly smear campaign. Ironically, as DC recently said > power to the people. The default position of the Liberals is that anybody outside mainstream British culture should be free to attack us. But if any of us responds we are racist or islamophobic. Now they want to be free to attack the other parties while anybody that attacks Gleggy boy is mean old nasty nasty. Trevor Kavanagh got it right on Radio4 this morning. The Lib Dems are living on the £2.4 million proceeds of crime. Again, well said, Iain. Someone said (it may have been you) that this was going to be the nastiest general election- and whoever it was wasn't wrong. This vicious partisanship will drag down the press, whether or not it succeeds with Clegg. What is quite interesting is that if you go to the Mail website and look at the readers' comments there is a significant amount of negative reaction to the Mail. Not sure Greg Hands' statement on the Telegraph story was the wisest intervention either. How many people are being driven into the arms of the Lib Dems by this garbage? I feel a backlash coming on. Why aren't the press instead asking this kind of question ? "the increase in National Insurance Contributions is a damaging tax on jobs and an unfair tax on employees, so when resources allow we would seek to reverse it." "We have already identiﬁed over £15 billion of savings in government spending per year, vastly in excess of the £5 billion per year that we have set aside for additional spending commitments..."
Given the above why are they so keen on implementing the "damaging tax on jobs" ? If Gordon Brown, the UK's foremost expert on raising taxes (though little else), can't raise anything even close to the 4.6 billion the Lib Dems claim in their manifesto to be able to find through "anti avoidance measures", what makes Saint Vince think he can do so ? Or are they just making sh*t up ? Wrong - Clegg is just like all the other troughers who did everything within the rules apparently. Why should it be any different for him to feel some heat. Strutting around as if he and the libdems are whiter than white. The Tories and labour should have dealt with this some time ago and not the press. The press, media and the pollsters fuelled all this. Yes he won the first debate but it did not warrant the media frenzy and force feeding from Sky in particular - the libdems are more extreme than labour - a scary thought IMO. Iain, you clearly have not learned how to defeat the LDs despite your drubbing in 2005. Lib Dems can only be fought in the gutter. OK but did you hear Chris Hune on the Today Programme and his disgraceful slurs on Labour and the Tories - of course its the 'con'servative party? The Liberals are a gutter politics party. Why were those donations channelled through Clegg's personal account. at the very least it was deeply, profoundly stupid to mix personal monies and donations in this way and shows a serious lack of judgement. And his EU expenses are simply outrageous. The Lib Dems answer? 'The expenses system in Europe is different'. Yes, indeed it is. Its totally corrupt. Members have refused to change it and when the auditor complained she was sacked on trumped up charges. Cameron should announce that UK law will make it mandatory for full disclosure of all expenses by UK MEPs. Lets clean out that lot as well. Try mixing your companies cash up with your own bank account and see if HMRC think its OK. The oik was caught lying on national TV last week, and you dont think that this mans character is worthy of scrutiny? Thank you, Iain. Your "I don't agree with Nick, but" paragraph is an excellent representation of the thinking I've always associated with 'conservative', if not always with 'Tory'  over the last 30 years. Good post, good point. the commment from thebluemenace at 5 is more or less the reverse. For the first time I find I disagree with you. Following the inexplicable bounce that Labour achieved after Brown’s character faults were published I was concerned that you believed the newspapers were making the same mistake. Without delay I went to my local newsagent and found under the (admittedly some lurid) headlines all the attacks with the exception of The Telegraph were on Liberal (Socialist) Democrat policies and not Clegg himself. The Telegraph is, perhaps, the furthest from “attacking the ball and not the player” but was this not Clegg’s version of “Back to Basics” by his holier than thou attitude to the expenses scandal? Perhaps Clegg is a “nice guy” but even the nicest can come under malign influence and after watching the Neil/Flanders demolition of Cable, we now just how malign and hypocritical Clegg’s closest political associates are. And this is not limited to the top of the party. Our local candidate in Maidstone & the Weald is using every tactic of disinformation (to put it politely) to try to win the seat. He is a carpetbagger having failed to dent Michael Howard’s majority in Folkestone in the last two elections. He has even got Joanna Lumley to write a personal letter to voters on his behalf, not mentioning she is funding the Green candidate in Brighton! Daily Referendum makes the very valid point that Clegg has all but been ignored until last week’s broadcast. Indeed, the LiDems have been regarded as the „Nothing Party“ for as long as I can remember. Silly policies, out of touch with reality and much more besides. Hearing Clegg for many, was the first time they knew he existed and like all good salesmen who have nothing much to offer, he generalised his statements to be as neutral as possible without referring to LibDem policy at all. The average couch potato took all of this in however and were immediately soaked in his innocent radiance like the second coming! It is only since the LibDem policies have been revealed during the last week and a trawl through Clegg’s history that cracks have been revealed. Mr Innocent is as bad as the others and the smoke is now clearing to reveal the truth. I have had very bad experience of the LibDems going back over 20 years as a District and Town Councillor when their group crawled to me and other councillors, for support on an important local issue. They had fed us nothing but lies and deceit for close on 2 months before I stumbled on their true agenda and was able to reverse our support. After all this, their leader was quite unrepentant and informed me that lying was an important political tool as far as he was concerned. The LibDems are a nasty bunch, including the Cable accountant. Someone should really take a close look at this guy as his economic profferings so far have been anything other than intelligent! It's ironic that Huhne has leapt to the defence of his leader when during the Lib Dem leadership contest he put out the 'Calamity Clegg' leaflet and then got caught out with it on live TV - pathetically claiming it was issued by his office without his approval. It amused me at the time because even in their own leadership election the Lib Dems only know one way to campaign - attack your opponent in as personal a way as possible. What goes around comes around. There is nothing new or different about the Lib Dems and Clegg is no outsider. I don't like the style of these press stories about him - shrill, hyperbolic and almost certainly counter productive as you say. I won't be buying any of those papers. But the substance is not that personal in fact - it's about stuff Clegg has (allegedly) done or said in the past. He may be 'likeable' but so is Cameron - who is subjected to relentless personal attack on account of his parents' education choices. If this stuff didn't sell papers they wouldn't run it. There's something in human nature that loves to put people on pedestals and then knock them off. Palm Sunday followed by crucifixion. Why should Clegg be immune from this - stupid though it may be? Sorry Iain - have to disagree with you on this one. Live by the sword, die by the sword. Unfortunately, nice guys finish last. All the wordiness up above, while the public will make up their minds tonight, and later at the ballot box. They are sick to death of NuLab, and Cameron doesn't cut it -- the Blair wannabe who can't pull it off. Whatever the rights and wrongs of the dirty attacks on Clegg, the public are desperate for change. And they'll vote to get it. But it won't be "Dave"'s change. And if it's a hung parliament, the nobs will have to live with it. All of them, including Murdoch. HampsteadOwl and many others clearly do not understand the definition of the word 'insidious'. Clegg did not say that Britain had more to be ashamed of than Germany. He said that Britain's flaws were better hidden, less immediate, but still harmful. People seem to have jumped to conclusions without actually understanding what he was saying. I'm not defending the message, but, please, at least make sure he's actually saying what you think he's saying. "Gideon Osborne (yes that is his real name)"
Do you really want to invoke the spirit of the Biblical Gideon? It is no justification to say that the LibDems are as bad. The Nationalist Chinese were on the winning side in WW2. Cameron has not spoken on any military threat to us posed by Taiwan. The Chinese Communists did not actively fight the Japanese except for a handful of very minor actions (so minor that they don't get into Wikipedia) but instead attacked the Kuomintang Nationalist forces that were fighting the Japanese invaders. After the war ended, the Chinese Communists (helped by Stalin) attacked the elected government which was drained by fighting an eight-year war against a more technically advanced enemy and being stabbed in the back by its nominal ally. Iain, I applaud your attitude to politics. This is how it should be and this is an excellent explanation of just what's happening in the press today. A good and fair comment. I haven't seen the Sun and Express attacks. The Mail one is absolutely shameful. Clegg's Guardian article - which is *eight years old* - is very fair and reasonable, and when I read it I entirely agreed with it. In America, it's considered political suicide for any politician to criticise America in any way. It seems the Mail wants to encourage this attitude here. If I were neutral about Clegg before today, this alone would have made me determined to vote for his party. The Telegraph attack was much fairer, in that it was actually about something potentially substantial, but it had the disadvantage of being incredibly weak. The sole point of criticism was the bank account into which the donations were paid. There was no suggestion that there was anything dodgy about the donors, the money, or the use to which it was put, and Clegg declared everything at the time and was wholly within the rules. This is not duck house territory. If that's really the worst that can be dredged up about him, he's not looking too shabby. Incidentally, it seems that the Mail repeated its shameful attack on Clegg's family background and wife in its editorial today (even with the weasel words "It might be unfair to say..." before saying it). It seems the Mail is no longer aligned with the Conservative party but has moved decisively into BNP territory. Hats off to you for that excellent, heartfelt article, Iain. I don’t share your views politically, but I wholeheartedly agree with you about this. I also have a degree of admiration for you for swimming against the tide today. Well done. sorry - i have to disagree with you iain. Thank you for a sensible point. I want an election campaign about policies and ideas. I'm sick of spin, cynicism and negative campaigning. I'm sure I'm like millions of other voters. I want change and I want a better country, not this mud slinging. Yes, let's hear some proper criticism of the Lib Dems, let's interrogate them on their policies and whether they are really in step with the country's wants and needs. But the American-style political bitchiness has to stop. And I really admire those politicians who stand up for their opponents when there is unfair campaigning. Well done to you to come out and say this, and may some decent Labour politicians also criticise Harriet Harman for her nasty comments about David Cameron. It gets us nowhere. Ian, I disagree with much of your ideology, but I have a tremendous amount of respect for this principled stance you are taking. Baseless smears demean politics for all of us. Of course the tory rabid press have to attack clegg as the tories whole campaign has been reduced to trying to scare voters into voting for them as they have no positive policies to help the u.k at all.If they get in the economic crisis will get worse with osborne at the helm.I for one hope come may 6th we have the start of a permanent change to uk political landscape and been stuck with the same old 2 parties who do absloutely nothing in the end but create more disaster. No party who tries to scaremonger people into voting for them in such a below the belt way deserves power so let's hope cameron and his cronies find that out come election day. When British politicians stop creating legislation that demands to know every last minutiae about me & my life, then I'll let them enjoy their freedom. Until then, I'll savour every last bit of tittle tattle on them. Remember, they didn't want us to know about their expenses fiddles. Politicians now rank below second-hand car salespeople & estate agents in the heirarchy of comtempt. Good point. This, the most open election in years, should be based on policy and not on personal attacks. "The Mail runs a spurious story about Nick Clegg making a supposed Nazi slur against Britain." How exactly was it spurious? Really, I'm just interested. A link that shows how Clegg didn't say what has been claimed, or that the comments are similarly inauthentic would be appreciated. 1.not genuine, authentic, or true; not from the claimed, pretended, or proper source; counterfeit. Iain, I agree with your sentiments and in an ideal world politics should be clean and all about parties being civil, debating issues and policies with the press reporting on it without bias, but British politics is a dirty business. It's always been a dirty business. And the Lib Dems are no stranger to this what with their tactical voting, pact with Labour and decapitation strategies. I remember how in the 1990s how the tabloids demonized the Conservative party nearly every day rendering it unelectable. I don't recall the opposition parties moaning about it and asking the press to play fair. So when I see the headlines in the press I just shrug. What goes around comes around. I had to laugh at the gall of Peter Mandelson moaning about "Tory dirty tricks" and defending Clegg. What an absolute hypocrite of the highest order. I probably disagree with you about most things but this was a great post. This kind of attack is shameful and degrading. Iain, Are you saying these attacks are untrue? If they are not the press have every right, nay duty, to report as they have done. And I might add, you as a Conservative should applaud them for so doing. As a long time Labor voter who was going to vote for Cameron, I'm so disgusted by these attacks that even though I disagree with a number of Clegg's policies I'm still going to vote for him rather than reward the media moguls' preferred candidate. If Clegg is a "transparently decent individual", what is Call Me Dave? I am quite thinking about the gifts for her but I never find what should be that is ? I was surprised to hear Nick Robinson say on Radio 4 this morning that he felt this was all fair comment from the papers. Most of it was indeed about policy not personality. I think you've called this one wrong, Iain. Sure, criticism is welcome, but attacking Clegg on the basis of his ethnic heritage and lying about the article he wrote on British hang-ups about Germans is overstepping the mark. If it was orchestrated by Conservative Central Office (and different newspapers did seem to have much the same article), then it really reflects badly on Cameron and will backfire. Well, I don't agree, Iain. Clegg is the devil. He isn't fair...he sounds fair but then so did Stalin. Don't fall for his smarm; if you let them get in they will create an Animal Farm and PR will rid this country of decent leadership. Nick Clegg has persistently tried to pass himself off as a typical Yorkshireman, speaking passionately of ‘my city of Sheffield’. He is the MP for Sheffield Hallam but there his claims of being a Yorkshireman end. In the weeks since the election began we have learned that despite his apparent down to earth name, Nick Clegg is the son of a Dutch mother and a half-Russian merchant banker father. He spent his childhood living in a Buckinghamshire Mansion, which he himself, has described in more candid moments as “affluent”. Companies House records indicate that his father Nicholas, who also owns a twenty room chalet in the Alps and a Chateau near Bordeaux, is the Chairman of The United Trust Bank which specialises in financing property developers, the sort of risky lending Vince Cable says he wants to curb. ‘Yorkshire Nick’ enjoyed the privilege of a Public School education at the £30,000 per year Westminster School. As a boarder there, his fag was none other than TV’s Louis Theroux. Clegg doesn’t deny it, he just uses the old political chestnut of saying “I have no recollection of being woken up by Louis Theroux“, one of Mr Theroux’s stated duties as Mr Clegg‘s fag. Clegg went on from there to study Social Anthropology at Robinson College, Cambridge, where he joined the Cambridge University Conservative Association. Despite claiming to be the only Party Leader who is being straight with the electorate, he refuses to confirm this. A staunch Europhile, Mr Clegg went on to study at the College d’Europe in Bruges from where he went on to find employment with ex-Tory Minister Leon Brittan, who was the European Commissioner for Trade at the time. Clegg also worked as a lobbyist for GJW between 1992 and 1994. Nick Clegg enjoys a similar privileged background to David Cameron. David Cameron has always been perfectly honest (you could say straight) about his family heritage, in contrast to Mr Clegg, who attempts to pretend to be an ordinary down to earth Sheffield lad. Such behaviour is a betrayal of his own family, and inconsistent with his claim to be the only leader who is being straight with the voters. Surely revealing Nick Clegg’s true background in order to challenge his attempts to mislead voters about his privileged background is no less than he could reasonably expect. It is essential that hypocrisy, especially in politicians be exposed, particularly in those who aspire to be Prime Minister. "Straight" seems to imply that being a Yorkshireman means having a Yorkshire heredity and being poor. Anyone living in Yorkshire is a Yorkshireman, whether they are black, white or Dutch. And Yorkshire is not devoid of millionaires. So what if this man is from a wealthy background? It would bother me more if he sought to protect his own kind, which his party's policies suggest he is not. A little less of the ad hominems - not just against Nick Clegg but all politicians - and we just may get the sensible politics we crave after this atrocious expenses scandal. Yorkshire is no different to any other County, Delta Pavonis, in terms of it's racial and social mix. What we don't appreciate, is someone who has had what is termed a privileged background in Buckinghamshire, attempting the pass himself off as an ordinary Sheffield lad. Being straight with someone in Yorkshire, means being honest! Iain Dale was suggesting it was a mistake for newspapers to reveal things about Mr Clegg, that maybe he was not too keen for the wider electorate to know. I disagree! We need to know as much as possible about politicians who wish to become our Prime Minister. We know pretty well all there is to know about Gordon Brown and David Cameron because of their previous high profile. As a 'newcomer' to the majority of the population who are not in the main, interested in politics, it is important that people learn as much as they can about Mr Clegg in order for them to make an informed choice. For example, the fact that Mr Clegg was once a member of the Conservative Party might be an important factor in the mind of a South Yorkshire miner, when deciding whether or not to cast his vote for Clegg. As for the MP's expenses scandal, most of the people elected to the next Parliament will be new and subject to a totally different, stricter type of accountability. I say to you and everyone else distracted by this issue, get over it! In the present parlous state of the economy, it is important for us all to be looking to the future not wallowing in the filth of the past. Just wondering - if Nick Clegg loves Britain so much, why did he name his kids Alberto, Antonio and Miguel? Sound like he has taken his "love of Europe" to a point that suggests he is embarrassed to be British. Or just so PC he would be useless in government.